I recently finished painting a portrait for my friends, and decided to return to the preliminary pencil sketch that I made before painting, and finish it. Today I worked on the background and the clothing, but also modified the shape of the face and the hairline, bringing them closer to the photo I am using as a source. I also added some shadows to the face. Even though my art show doesn't official start until February 1, I was offered the chance to hang the show today, and I was glad to do it. 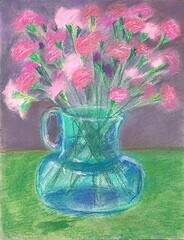 So early this morning, I took a photo of this pastel with my digital camera because I realized that I have digital images of all the pastels in the show except this one. Anyway, everything went according to plan and by noon, I had all the art up on the wall. But tonight, as I was posting the digital image, I saw some problems caused by photographing a matted piece through glass. So I opened the image in Painter IX and did some very gentle editing with a light dusting of digital pastel. I guess it is time for another Colorado picture. 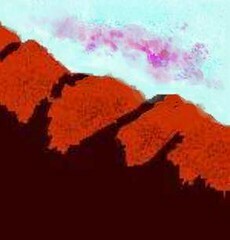 This is one of the first images I made with my Clie handheld paint program, and of course, I drew a mountain, working from my imagination and my memories of Colorado. Tonight I opened the image in PainterIX and cleaned it up with a little digital pastel. 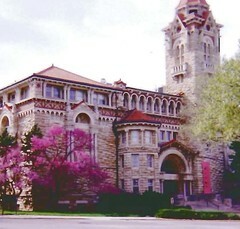 Here is a nice memory from Lawrence, Kansas, a photo of the Natural History Museum at KU. My children enjoyed this museum when they were growing up, and so did I. I took this photo in spring, as you can tell, and the red-bud trees on campus are amazing. I had a great time when we lived in Lawrence, and have wonderful memories of and strong connections to the people I met there. Even though it was cold today, we had sun and bright blue sky. 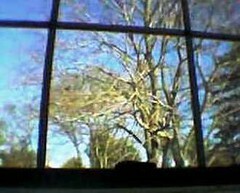 I had a lot of work to do today, but while I was at the computer, I found myself looking up at the tree outside the window. I liked the way the tree looked against the shapes created by the window's frame. I decided to take a few pictures with my phonecam. Tonight I edited them on the computer, and this is the one I like the best. I recently finished the portrait that I have been painting for my friends. Now that the painting is done, I decided to go back and finish the preliminary sketch I made back in mid-September (and posted here on September 14 and September 22, 2005.) Today I worked on the background, and this is what it looks like tonight. When I woke up, it was snowing and we had more snow on the ground this morning. After my son and I finished shoveling, I went back outside with my digital camera and took pictures. I took this photo from below, standing under the tree and looking up. 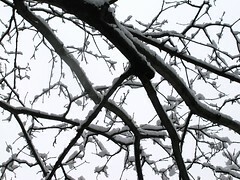 I was intrigued by the intricate tracery of the snow-covered branch against the white sky. This is a piece of digital art that I made tonight. When I opened a new document in Painter IX, I didn't have a specific plan. Earlier today I had spent some time matting and framing pastels for my art show next week. I guess all that time spent with rectangles might explain why began this by creating some rectangles within rectangles in black and white. I had a vague idea about filling shapes with patterns to make a digital collage, but by chance I opened the image hose brush, a tool I almost never use. I decided to try it out, and chose the passion flower nozzle. I adjusted the size of the nozzle and put in some individual flowers. I liked the design, so I kept going. 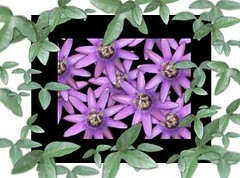 Then I added some passion flower leaves, too, in various sizes. This was just an experiment, but I decided that I like it well enough to post. It snowed today, so this morning I used my digital camera to take some pictures. 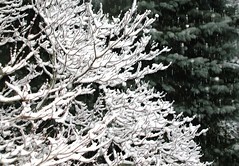 The blue spruce provided contrast for the falling snow, as well as for the lacy snow-covered branches of the dogwood tree. I took several photographs of this, then later I cropped and edited them to get the composition right. This is the one I like the best. I took this photo two years ago in early January during a visit to Northern Ireland. Justin, Mel's colleague at Queen's, invited us to come to Enniskillen, and arranged for us to stay on the shore of Loch Erne in an old manor house that is now a hotel. The morning light on the lake was amazing, so I took this picture. I decided to post this today because Justin is visiting the U.S. and will give a talk tomorrow at UNH. Tonight we met him at Logan Airport and took him out to dinner. For the past few days, we have been having another spell of warm temperatures, in the forties and fifties. Yesterday we took advantage of the weather and walked on the beach at Lynch Park. 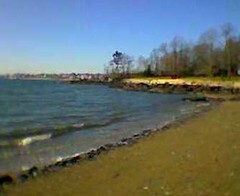 I used my phonecam to take this picture, a view of Beverly seen from the beach. For this image, I had to adjust the color and the contrast on the computer afterwards. The amount of detail is sometimes limited with the phonecam, especially with a landscape, but the spontaneity is great and it does a good job of capturing the composition. Later on, I might use a photo like this as the basis for a painting. Time for another picture from Portugal. This image began as a photo that I took in Cascais, Portugal, during a July visit a few years ago. I loved the sunny streets of Cascais, and was attracted to the yellow house on the corner. I call this a fantasy because it is digitally modified, and I have changed the colors by using Painter IX's digital watercolor. As I decide on colors to apply, I look at the original color and try to intensify it if I can, but then as I get going, I let my imagination take over. But I want to point out that the one color that I have not modified at all is the bright yellow house on the corner. Sometimes the reality of Portugal is more fantastic than than anything I could imagine. 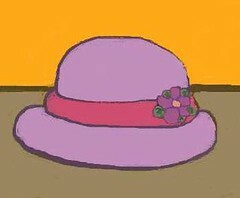 The other night, I started sketching on the computer (with Painter IX's digital chalk) and realized I was sketching hats, apparently inspired by my visit with my friend Pam. She has a collection of terrific hats. It is always fun to see her hats, and I love the way she looks in them! 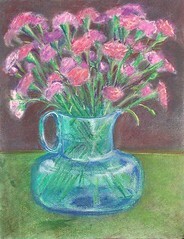 Here is the pastel drawing of carnations, as it looks tonight. Today I adjusted the elipse at the base of the pitcher, and the position of the spout. I worked on the background and added some shadows, within the bouquet and on the table. There isn't too much more to do, which is good because the carnations on my kitchen table won't last too much longer. . . . This is a digital watercolor that I painted several years ago, based on memories of the Colorado mountains. I have been thinking about Colorado because today I had a chance to see a friend that I have been close to since high school back in Colorado. She has been visiting Colorado recently, and today returned to Maine via Boston, so we had a chance to get together. 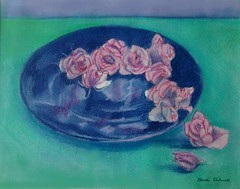 Late this afternoon, I had a chance to work on this pastel again. I did a little more checking and correcting of the underlying geometry, using T-square and ruler. 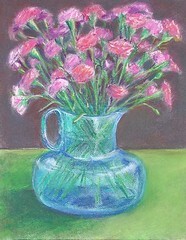 Then I worked on balancing the composition and adding more color and depth to the carnations. This is still a work in progress. . . . It is very cold and windy tonight, but earlier in the week we had a January thaw, several days with high temperatures in the fifties, and no snow on the ground. So we took advantage of the opportunity to go to Long Hill Gardens to walk the dogs. I grew up in Colorado, and am still surprised to see green in January here in Massachusetts: green grass and bright green rhododendron and azalea leaves peeking out from under melting snow. 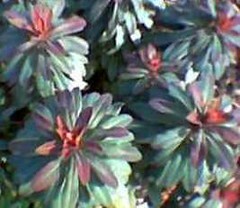 While we were walking around the gardens, I noticed these little plants, and I used my phonecam to take a picture. Tonight I cropped the image to get the composition I wanted. I don't know what these plants are, but I was impressed by their color, their pattern, and their optimism. 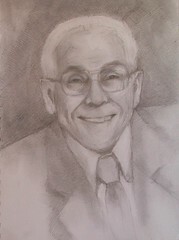 This is the portrait I have been working on for my friends. Today I made a few small adjustments to the mouth, then modified the shadows on the shirt. I think it is just about there, so I signed it. But if it turns out that there is something I need to correct, I won't mind because I have really enjoyed painting this portrait. Since two days ago when I last posted this work in progress, I used a ruler, to check the lines and most important, the elipses. I worked on this drawing in daylight for better light. I added some detail to the pitcher and flowers, and deepened the background for contrast. This still needs a bit more work, so I will say to be continued. . . 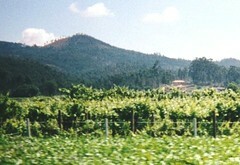 Here's another image of Portugal. This is from my very first trip there. 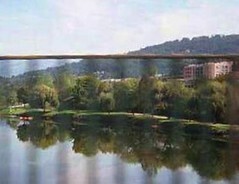 I cropped this from a picture I took of Rio Lima as we drove across the bridge, headed north from Porto to Vigo, Spain. Tonight, I adjusted the brightness, contrast, and saturation to try to make it possible to see both the bridge and behind it, the scenery and its reflection in the river. We see so much of life from moving cars. It isn't always possible to stop to take a picture, so I decided long ago to take a picture if I really want to, even when it seems unlikely that it will come out. Sometimes I am disappointed with the result, but sometimes I am pleasantly surprised. This is a work in progress, as you can see. Tonight I transferred my carnations to a blue glass pitcher. 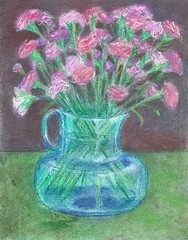 I got out my pastels, and blocked in the pitcher, the table, and the general position of the flowers (which are as always hopelessly and wonderfully complicated). Once I got the drawing to this point, I stopped because it is just a sketch and can be easily changed. If things work out, I hope to complete this pastel in sunlight. My pastels are going to be shown at the local Barnes and Noble in February (an opportunity that came up last week) so I would like to get a few more pastels done. It's not that I don't have enough of my pastels on hand; I probably do. But for me, the biggest benefit of an upcoming show is the urgency of making more art, so I am trying to capitalize on that. To be continued. . . . Yesterday I picked up two bunches of carnations. There were more elaborate bouquets, but I liked the color of the carnations, and decided they would do. I intended to draw them with pastel, and planned to work late last night and early this morning. But the dog got sick, and I made a very late night run to the vet, and I stayed up most of the night taking care of him. It paid off, because he is doing much better now. But I had no time or energy left to draw today. Maybe tomorrow. 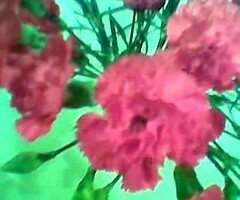 So instead I decided to photograph the carnations with my phonecam. I liked this composition the best, despite a couple of small flaws that were distracting, so I opened the image in Painter IX and cleaned it up with digital pastel. For now I think this picture will do. I have been meaning to post this photo that I took on January 1. I guess I had better hurry and post this before the snow is all gone, because we are headed into warmer weather (mid-forties, they say). 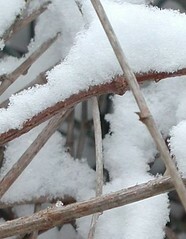 I began this image by using my digital camera to zoom in on the details and complications of snow on the vines on my fence. 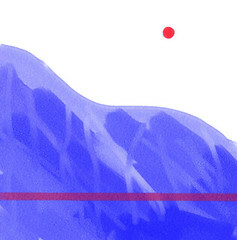 Later, I cropped the image into four parts, resulting in even closer views, and four images that almost look abstract. Of the four views, this is the one I like the best. In January, it is nice to see some green fields and blue sky, so here's a picture I took one July in Portugal during one of my visits. This is north of Porto near Ermesinda. Tonight I cropped the image to improve the composition, and adjusted the contrast just a bit. We saw Woody Allen's "Match Point" today, with its great images of London. (Some scenes even take place in the Gherkin, which I invite you to see in my blog entry of March 14, 2005, "Considering the Gherkin"). 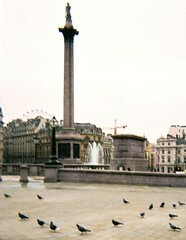 Here is another view of London that shows both old and new, from Trafalgar Square to the London Eye. I call this a fantasy because it has been digital modified, and I have taken liberties with the color. This image began with a photo that I took during my short visit to London two years ago. Tonight I cropped the image, and then opened it in Painter IX, where I added some gentle digital watercolor, to create just enough color contrast to make the patterns visible, and to make it possible to see the London Eye (and the construction crane)in the background. 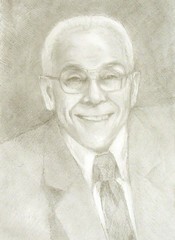 This is the portrait I am painting for my friends, as it looks tonight. I think this painting is getting close to finished, so I wanted to correct a few things I have noticed over the past few days. Today I concentrated on adjusting the hairline, making the forehead wider. I also modified the mouth very slightly, and and added some highlights and shadows to the face. I don't want to say that it is finished, because the minute I say that, I will see five things that I want to change. . . . 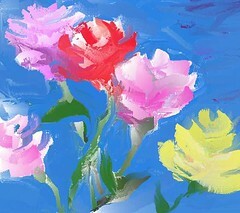 It's too late for the Rose Parade, but here are some digital roses that I created a couple of years ago, using Painter IX's digital oil paint. I don't know why roses make sense in January, but they do. Last night and today I did a series of drawings to be used as an illustrations in a workshop. 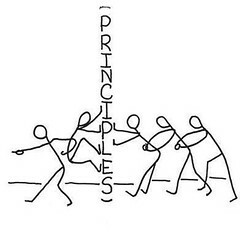 They are all cartoons using little stick figures. I drew the cartoons using felt-tip pen on paper. After I scanned the drawings into the computer, I opened them in Painter IX and cleaned them up with digital bleach. I did about eight drawings, but this is the one I like best. 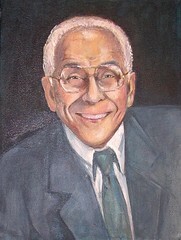 Here is the latest version of the portrait I am painting for my friends. In addition to sharpening up the collar and tie, I have been making small changes to the face, using a very small brush and being careful so I can avoid losing what I already have. I adjusted the eyeglass shape, modified the hairline, and changed the position of the mouth just a bit. Small details are important when it comes to portraits. I want to capture a likeness, as well as an emotional sense of the person, which in this portrait, relies almost entirely on the facial expression. 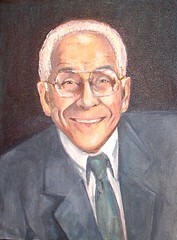 When you paint a smile, you are trying to capturing a fleeting expression, a face in motion. In this case, it is a wonderful smile, and I am trying to do it justice. Here's an image from a New Year's Day adventure that I had two years ago, during a trip to Northern Ireland. We spent the day in Enniskillen, where one of Mel's colleagues lives. 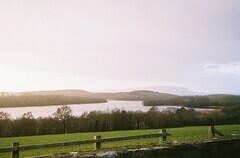 He gave us a tour, driving the perimeter of Loch Erne, and then suggested a late afternoon lunch. 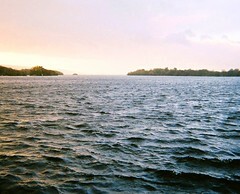 The surprise was that lunch was on an island in the middle of Loch Erne, and that the only way to get there was on a very small ferry, big enough for just one car or in our case, three pedestrians. That's where I was when I took this photo. Tonight I cropped the original to improve the composition. I adjusted the lighting and saturation to re-capture the excitement of the day and the beautiful colors of the sky reflected in the water. How about another image from Portugal? 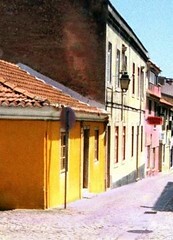 I cropped this image out of a photo I took in Aveiro during a visit to Portugal in July, 2001. Portugal is an amazing mix of very old and very contemporary. Although the image might suggests an old world setting, in fact I cropped this out of a photo of a very modern shopping mall (called a "shopping" in Portuguese). 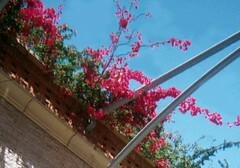 This beautiful outdoor mall is adorned with bourgainvillea all along the roof line. I love the bougainvillea against the clear blue sky. But although the sky was blue in the original photo, it wasn't exactly clear! In fact, there were multiple guy wires visible against the sky. So I decided to use a little digital magic, opened the image in Painter IX, and made them disappear with digital airbrush.